The American Ivy Society, Inc. The American Ivy Society, Inc.
More ivies to be added from time to time. Descriptions are courtesy of Hedera etc. NOT FOR REPRINT IN ANY MEDIA WITHOUT WRITTEN PERMISSION. See Media page for details. 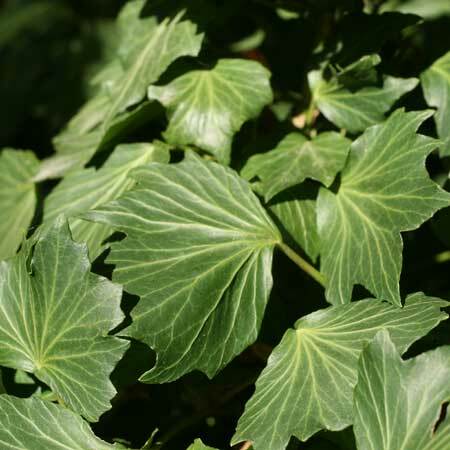 Hedera helix 'Medusa' (O,F) Leaves with three to five and sometimes more, forward pointing lobes; base cuneate to truncate, and an irregular toothed margin. There are raised veins radiating out from the petiole. New growth light green, maturing to dark green with lighter veins. 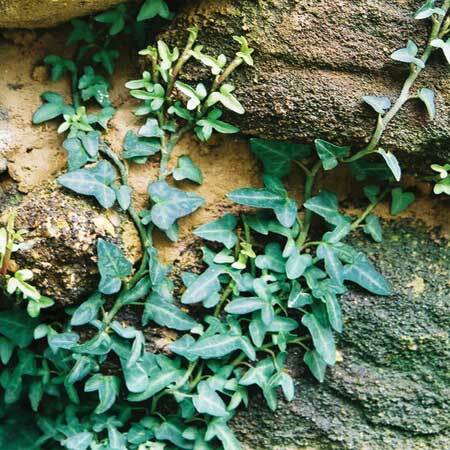 This unusual ivy grows stiff and upright because of a fasciated stem. 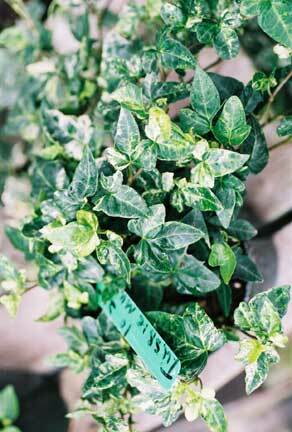 Hedera helix 'Midas Touch' (V) A Danish introduction, originally called 'Golden Kolibri'. Leaves three-lobed, heart- shaped. Color is gold to yellow, with a bright green margin and center splashes of green. Pink stems and petioles. 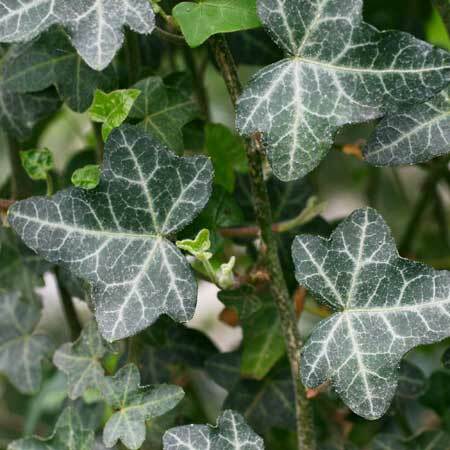 Hedera helix 'Misty' (V,M,BF)- Synonym 'Silver Lace'. 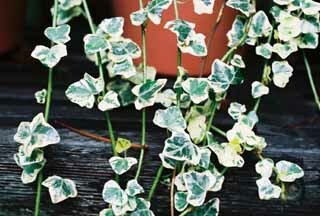 This sport of 'Needlepoint' is a small, compact, self-branching ivy with five narrow lobes. The center is colored with various shades of gray, with white veins, and a very narrow white margin. Ivy of the Year 2005. Hedera helix 'Plume d' Or' (BF) A five-lobed ivy with almost linear lobes; lateral lobes at right angles to the terminal lobe. The two basal lobes point backwards. 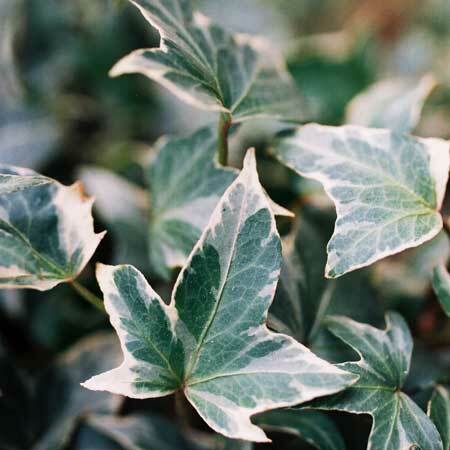 Hedera helix 'Reef Shell' (O) A sport of 'Zebra'. Leaves oblong,convex with two to four teeth at the terminal end. Veins white and raised,with an irregular margin of cream to white,and a gray-green center. Hedera helix 'Ritterkreuz' (BF) Ritterkreuz is German for Knights Cross and the leaf shape is reminiscent of a Maltese Cross. This ivy sported from Hedera helix ‘Perfection’, a large ‘Needlepoint’ ivy at the Neuburg, Monastery Nursery, Heidelberg, West Germany and was registered by Brother Ingobert Heieck in 1981. Ivy of the Year 2010. 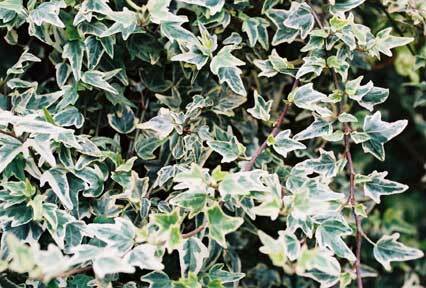 Hedera helix 'Spetchley' (M, BF). (Synonym: 'Gnome'). One of the tiniest ivies. 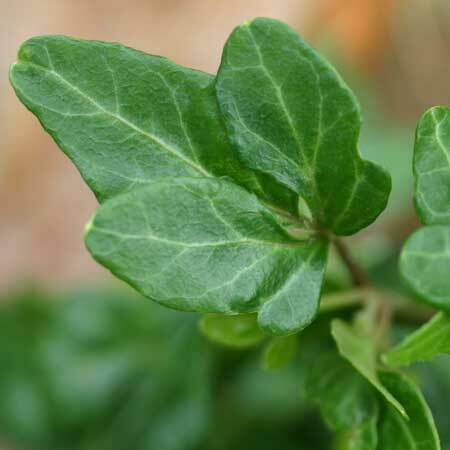 Leaves leathery, dark green, three-lobed with an elongated, rounded terminal lobe. Stems of new growth are maroon. Hedera helix 'Teardrop' (H) As the name implies, leaves are teardrop-shaped. Leaves mostly unlobed, but occasionally two or more lobes can be found with a heart-shaped base. Leaf tip elongated to point. Slow growing and stiffly branched. The leaf shape is probably the result of a fasciated petiole. Good out door ivy. Hedera helix 'Teneriffe' (V, I). 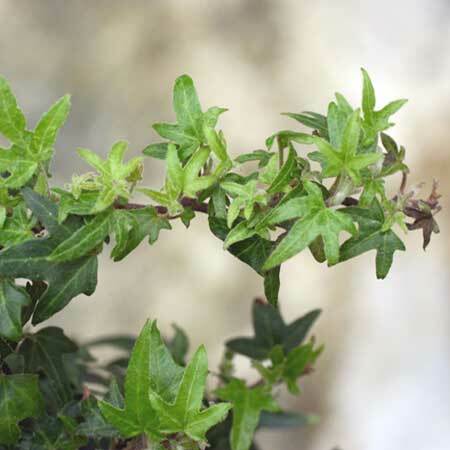 Leaves slightly wider than long, mostly five-lobed, or three-lobed with shallow sinuses. 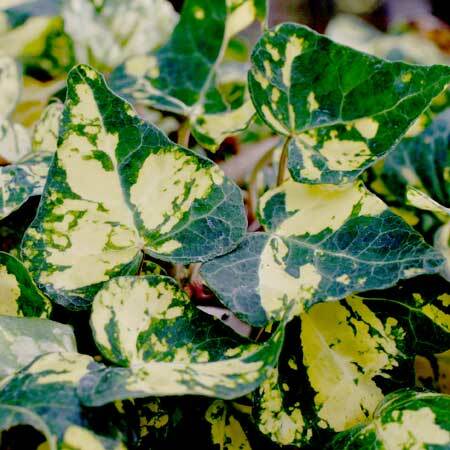 Variegation combines three shades of green blotches, speckles and dots on a yellowish-to-cream leaf. 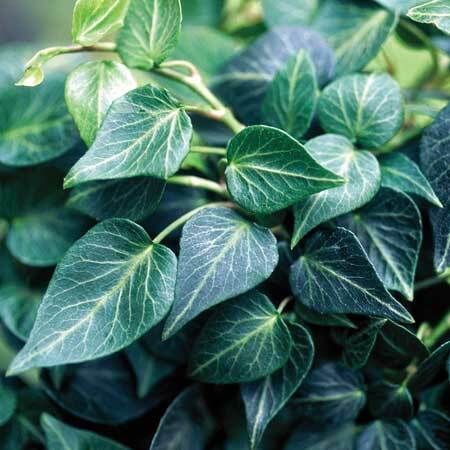 Hedera helix 'Tussie Mussie' (V, BF) A presumed sport of 'Shamrock'. Compact habit with extremely variable leaves. 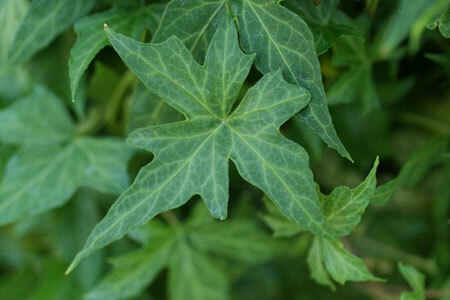 Leaves usually three-lobes, but sometimes unlobed or with two small additional lobes. 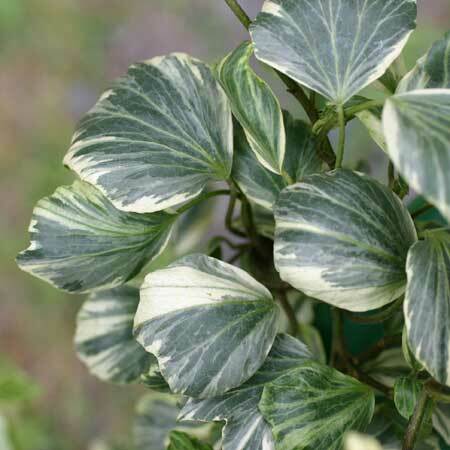 Leaf color medium green with various marbled and speckled areas of gray or gray-green, or nearly white. Hedera helix 'Walthamensis' (I). 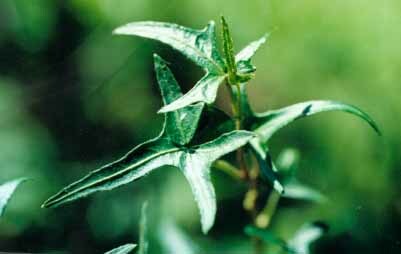 Dark green leaves like miniature 'Hibernica' leaves, but with rounded lobes. Leaves as wide as long with broad terminal lobe. In winter leaves blackish-green with white veins.